Aim of this work is to verify the effect of some neurotoxins, physical factors and geography in presentation of some Relevant Neurological disorder like some form of ASL, PD, AD. (PMMA) is a commonly used alloplastic material when autologous bone is unavailable. Neuroscience is also known as Neural Science. It is the study of how the nervous system develops, its structure, and what it does. Journal of Neuroscience and Neurological Disorders aims to publish manuscripts that can be an impeccable record for comprehensive patient care, teaching and training of students as well as contribute significantly to the scientific literature in terms of research. 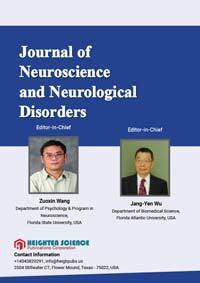 Journal of Neuroscience and Neurological Disorders prioritizes the study of neuroscience and its role in diagnosis and treatment of neurological disorders. The extension of life expectancy and the ageing of populations globally are predicted to increase the prevalence of many non-communicable, chronic, progressive conditions including neurological disorders.